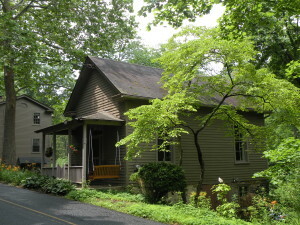 This circa 1860 one-room schoolhouse today is located on Carversville Road, just across from the intersection with Stover Mill Road. This structure was originally located next to “The Parsonage” up the hill on Wismer Road. 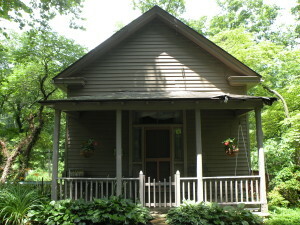 The Parsonage was built as the residence for the Rev. 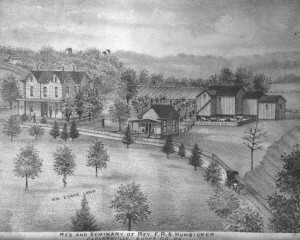 Hunsicker and family, who ran the Excelsior Normal School, which operated as a non-sectarian boarding school until the 1870s. 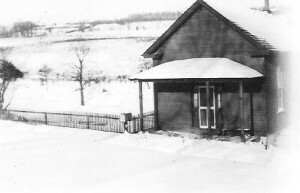 The one room schoolhouse, then called the Seminary or Academy, was constructed off-site to provide religious education, first Mennonite and later Presbyterian, to students who volunteered or were directed there by their parents. After the Excelsior Normal School was closed, the little schoolhouse building was sold about 1883 to Dr. Josiah Hellyer and rented as a carpentry shop. In about 1894 log rollers were placed beneath the structure, and with teams of horses at both ends, it was guided down the hill to its current location where a fieldstone foundation had been prepared with useable basement space. Here it served as Dr. Hellyer’s dental office. He was the brother of Amanda Stover who lived in the “mansion” across the road. From about 1910 to 1914 the building served again as a school for students who had been attending the Cottageville School. After the students were moved to the Carversville School at Kirk’s Corner, the building had many uses, including a lunch and ice cream parlor, barber and harness shop, and a dress shop. It also was Charles Ward’s art studio for about 25 years.